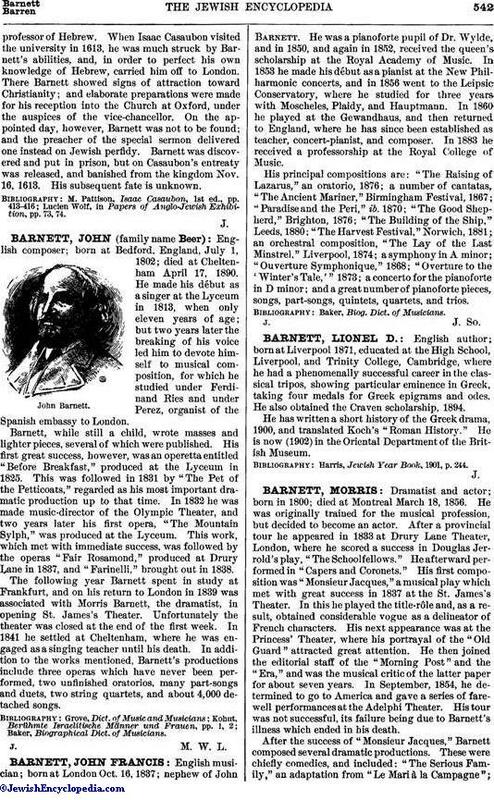 English musician; born at London Oct. 16, 1837; nephew of John Barnett. He was a pianoforte pupil of Dr. Wylde, and in 1850, and again in 1852, received the queen's scholarship at the Royal Academy of Music. In 1853 he made his début as a pianist at the New Philharmonic concerts, and in 1856 went to the Leipsic Conservatory, where he studied for three years with Moscheles, Plaidy, and Hauptmann. In 1860 he played at the Gewandhaus, and then returned to England, where he has since been established as teacher, concert-pianist, and composer. In 1883 he received a professorship at the Royal College of Music. His principal compositions are: "The Raising of Lazarus," an oratorio, 1876; a number of cantatas, "The Ancient Mariner," Birmingham Festival, 1867; "Paradise and the Peri," ib. 1870; "The Good Shepherd," Brighton, 1876; "The Building of the Ship," Leeds, 1880; "The Harvest Festival," Norwich, 1881; an orchestral composition, "The Lay of the Last Minstrel," Liverpool, 1874; a symphony in A minor; "Ouverture Symphonique," 1868; "Overture to the 'Winter's Tale,'" 1873; a concerto for the pianoforte in D minor; and a great number of pianoforte pieces, songs, part-songs, quintets, quartets, and trios.